A small but dangerous parasite, the winter tick, is spreading north and west as winters become shorter and now is knocking at Alaska’s border. The winter tick, which has already devastated moose populations in New England and the upper Midwest, has been confirmed in Canada’s Yukon Territory and in the Northwest Territories, where it’s infecting elk, mule deer and some moose. For moose, the winter ticks’ effects can be gruesome. The ticks gather in the fall on forest plants, latch onto passing animals and stay there through the winter, swelling to the size of grapes as they feed off their hosts’ blood. Tens of thousands of ticks can latch on to a single moose. They make the moose itchy, uncomfortable and prone to spending a lot of time and energy scratching, sometimes rubbing away fur, and too little time eating. Infestations are most dangerous for calves, which are already vulnerable in winter. 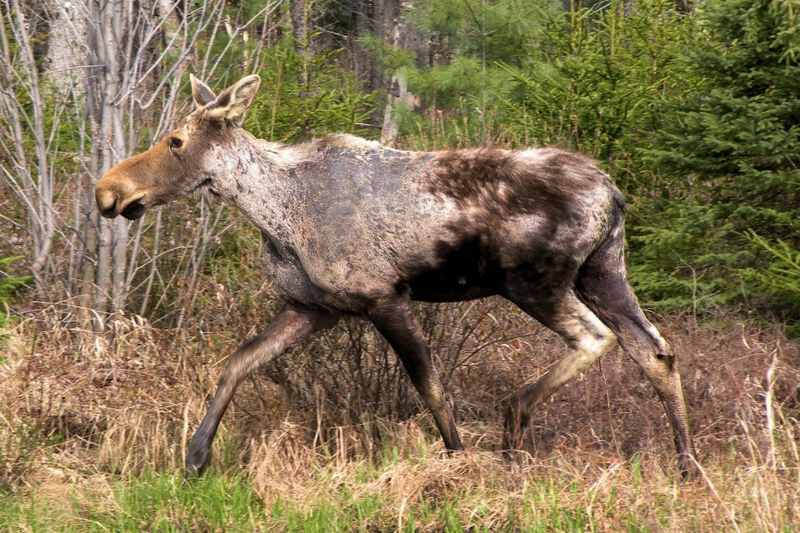 In some areas of New England, where infestations have swept through the moose populations, winter ticks have killed more than three-quarters of the calves. The average tick load on an infested moose is 40,000, and some have been found with 90,000, said Peter Pekins of the University of New Hampshire, one of the lead scientists studying the disastrous impacts of winter ticks on New England moose. A load of more than 40,000 ticks will use up a calf’s entire blood supply in four weeks, Pekins said. “They get anemic, they have declining weight too, and that’s just the end of them,” he said. Adult moose are more likely to survive, but reproduction has been affected, with far fewer cows giving birth to twins, he said. Although elk and deer are also infected, they are less harmed by the ticks because they groom their bodies regularly and are better able to remove the parasites, Pekins said. 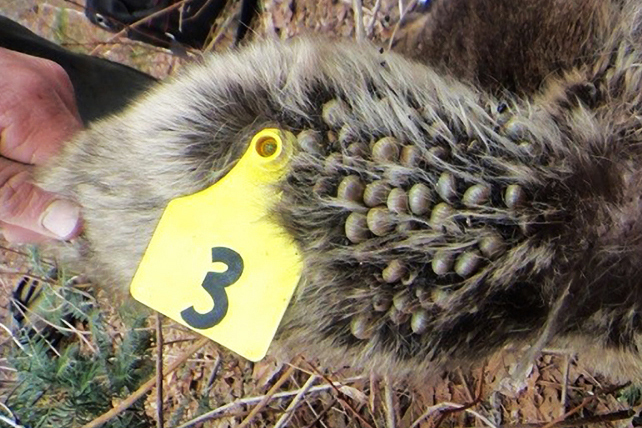 The spread of winter ticks is aided by the warming climate, according to Pekins and other scientists. Because of the timing of ticks’ life events, higher temperatures, earlier springs, later winters — the pattern in a warming world — help them survive, proliferate and attach to moose. Adults females drop off animals in the spring to lay eggs, Pekins said. For an egg-laying female tick, “Her survival is much higher if it’s bare ground than if it’s 2 feet of snow,” he said. The resulting larvae climb up vegetation and cluster together in the fall in big balls, which passing moose or deer can pick up — and they are affected by the timing of winter’s arrival, Pekins said. “The first snow event is key to killing the larval ticks that are up in the vegetation,” he said. As in New England state and winter-tick infested Midwestern states like Minnesota, shorter winters are cited as a reason for the spread in Canada. For Yukon wildlife, winter ticks have been most prevalent so far among elk, though they are found on moose and deer, territorial officials report. In the Northwest Territories, tick-infected “ghost moose” were first documented in the 1980s, and cases have increased since then. They have spread as far north as 66 degrees latitude in the territory’s Sahtu region, and have also been found on caribou, according to biologists’ reports. The Arctic Circle is about 66 degrees north latitude. If infested Canadian animals wander over the border during the time of the year they’re carrying winter ticks — between September and April — that might be all it takes to spread the problem, Beckmen said. “They’re going to drop those ticks in Alaska,” she said. Also ominous for Alaska is the result of past research, done by Beckmen’s predecessor at Fish and Game, which suggests winter ticks can survive even harsh Fairbanks temperatures. Randall Zarnke, a former Fish and Game veterinarian, and his research partners tested some captive winter ticks, monitoring adult females and the eggs’ hatch success in three Alaska locations, including Fairbanks; many test subjects survived, said the study, published in 1990. Alaska is already home to some ticks, contrary to occasional assertions that the state is tick-free. Some species, found on birds and rodents, are native to the region and have long been documented. Others, generally found on dogs, come from elsewhere. A recent study co-authored by Beckmen analyzed ticks and found 10 different species of ticks had been retrieved from dogs, cats, people, other mammals and wild birds at 29 sites around the state between 2010 and 2016. Some of the tick species were native, but some were not — and some nonnative species were found on dogs or humans without recent history of travel outside of Alaska, indicating those ticks have already settled in Alaska. The brown dog tick is one nonnative species that appears to be well-established in the state, Beckmen said. The study also included the first Alaska record of one species, Ixodes texanus, commonly called the raccoon tick, which was found on a marten. There is also one tick-borne disease that has long been in Alaska — tularemia. People exposed to tularemia are treated with antibiotics, but those exposures do not always result in formal diagnoses reported to health authorities, Beckmen said. Other serious tick-borne diseases have yet to be reported in Alaska. Not so in the European Arctic and subarctic, where tick-borne diseases are rising in a pattern correlated with increasing temperatures. A recent study analyzing four decades’ worth of data in Russia’s Komi Republic found a six-fold increase in tick-borne encephalitis cases during the 1998-2011 period compared to the prior decades. Average air temperatures in the Republic in the 2001-2011 period were 1.6 degrees Fahrenheit higher than the 1979-89 average, notes the study, by Russian and Swedish scientists and published in the International Journal of Circumpolar Health. 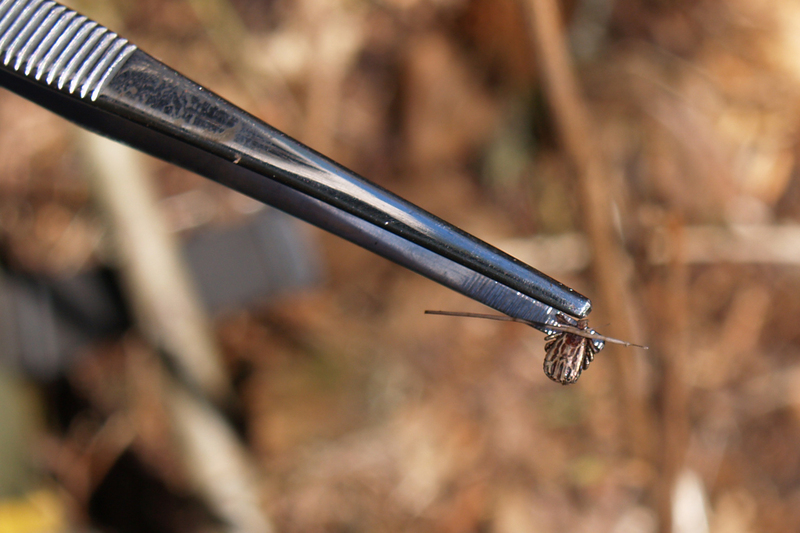 “We consider the influence of temperature as a main driving factor of the northward tick expansion in Komi,” the study authors say in their paper. Previous research by several of the same scientists found that the warming climate in Russia’s Archangelsk Oblast was behind a nearly 50-fold increase in cases of tick-borne encephalitis there compared to past decades. The mathematical analysis “revealed a distinct correlation between TBE incidence and the growth of mean annual air temperatures in AO in 1990–2009,” said their study, published in 2011 in the journal Global Health Action. Lyme disease, named for the Connecticut town where an outbreak of an arthritislike condition was traced to ticks, has also emerged as a threat in the European Arctic and subarctic. The bacteria that causes Lyme disease, Borrelia, was first documented in the Arctic in a 2007 study that explained how it was found in ticks infecting birds on Norway’s Varanger Peninsula, a site at 70 degrees latitude. Since then, there have been Lyme disease cases in northern Norway and other high-latitude European areas. The first documented cases of Lyme disease in a remote region of Yakutia in northeastern Siberia were reported in a study published last year. Eight people in villages in Yakutia’s Verkhoyansk region tested positive in 2012 for the Lyme infection, said the study, published in the journal Vector-Borne and Zoonotic Diseases.